THE BEST MMA GYM IN WESTCHESTER! BEGIN YOUR MIXED MARTIAL ARTS JOURNEY TODAY!! Brazillian Jiu Jitsu is the most effective Martial art they make. It’s true. You’ve seen the videos of Rorion Gracie taking on Bruce Lee wannabes, you know that any MMA fighter with his head on straight trains Jiu Jitsu and I don’t need to spend any time convincing you that BJJ is where it’s at. Whoever you are, The Jungle Gym is ready to kick your life into gear. We have cutting-edge techniques, many of which I design myself from my own extensive grappling experience. We have a format that is easy to fit your crazy /boring /exciting /stupid / awesome life. Most importantly we are a group of accepting welcoming people focused on honing our game and helping you build yours! What will Jungle Gym training do for you? LEARN BLACK BELT BRAZILIAN JIU JITSU! 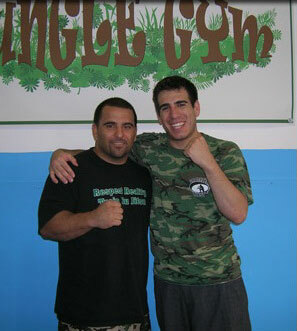 GET MMA COACHING FROM A PRO FIGHTER! Join the fastest growing team on the east coast! Call us right now let our full-time, professional team give you the skills you need and the physique you deserve. My name is Justin Garcia. I’m a Bronx Native and the founder of the Jungle Gym. I created this place to be everybody’s academy. Gone are the days when coaches cater to the “naturals” and ignore students because they’re not physical specimens. Here at The Jungle Gym, we will show you how to get the physique you deserve while teaching you the best fighting system on the planet! (Besides guns). Many of our members come here because they’re out of shape. There is absolutely no judgment here, only a big group of people with a similar history who want to see you win. Everybody who comes here consistently is going to amaze themselves with their inner potential. The simple but rigorous drills and techniques we practice are excellent for conditioning, but the real training secret is the exhilarating system of practice matches we play during class. You can challenge yourself mentally by trying for the techniques shown earlier in class, go at a relaxed pace with a more experience grappler to hammer out the fundamentals or just go nuts and pour Gatorade all over yourself like in the commercials. The structure is free-form and low pressure. It’s your own motivation that makes the workout intense! We never push anyone to move faster than their own natural pace, but that’s because we never need to. Jiu-Jitsu always keeps you reaching for more! Now , one of the most popular questions is “Justin, aren’t you just some dude dancing around in pajamas, acting like a tough guy cuz he watched ten minutes of a Bas Rutten video?” Folks, how many times do I have to remind you? This is: Real MMA taught by a Real MMA fighter! I’m not likely to be recruited by the X-Men any time soon, but I am a REAL fighter. I’ve been featured in the magazines Full Contact Fighter and Grappling, have more trophies than we can list here, and most of all am always ready to take on any challenger, to prove the Jungle Gym’s value, and to hold the flag high for Brazilian Jiu-Jitsu! Coach Justin Garcia is a real fighter. He’s been featured in the magazines Full Contact Fighter and Grappling, has more trophies than we can list here, and most of all is always ready to take on any challenger, to prove his ability, and to hold the flag high for Brazilian Jiu-Jitsu! Chim-Chim proves that Jungle Gym mma works! With training in BJJ, Submission grappling, Judo, Wrestling, and Mixed Martial Arts, I know what it takes to succeed in the competitive world of sports, and have been sharing my expertise with students for the last nine years. “Better than yesterday, never as good as tomorrow.” With the instructors to teach you and the students to help you every step of the way, The Jungle Gym is ready to change your life! 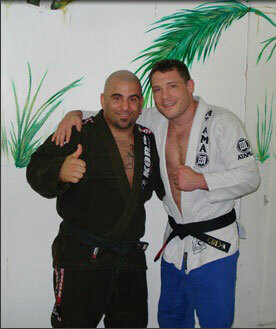 Rob Kahn, Royce Gracie Black Belt. Now is the time, get the ball rolling!